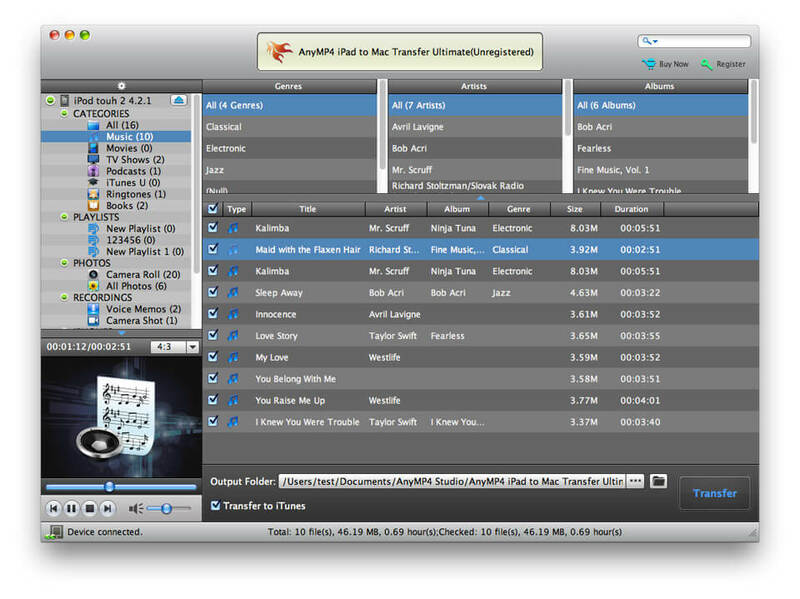 AnyMP4 iPad to Mac Transfer Ultimate is the versatile iPad Transferring software for Mac users. With it, you are able to transfer iPad files such as music, movie, picture, TV Show, Podcast, iTunes U, ringtone, ePub, PDF, camera roll, voice memo, camera shot and so on to Mac. Also, you can sync iPad files to iTunes. Besides, with this amazing iPad to Mac Transferring software, users can also backup iPhone SMS and Contacts on Mac. And it supports all of Apple devices like iPad 4, iPad mini 2, iPhone 5S/5C, iPhone 5, iPod Touch and the latest iOS 7. AnyMP4 iPad to Mac Transfer Ultimate enables you to transfer almost all the iPad files like music, video, TV Show, Podcast, iTunes U, ringtone, eBook, camera roll, picture and voice memo to Mac. Also, it can help users transfer iPad files to iTunes. Besides, it is highly compatible with all iOS devices (iPad, iPhone and iPod). This this iPad to Mac Transfer Ultimate, you are able to backup iPhone SMS and Contacts to Mac, thus they don't need to worry about losing your important information. Apart from these, functions, this software has the capability help you edit the ID3 information, like name, artist, album, track number, lyrics, etc. of every single file on your device is editable. AnyMP4 iPad to Mac Transfer Ultimate can help you preview the audio/video/picture effect conveniently with the built-in player it provides. Besides, this iPad to Mac Transfer Ultimate will detect iPad automatically once you connect it to the Mac. And it can show you all the information about the device on the main interface.